We then set off for the train station. 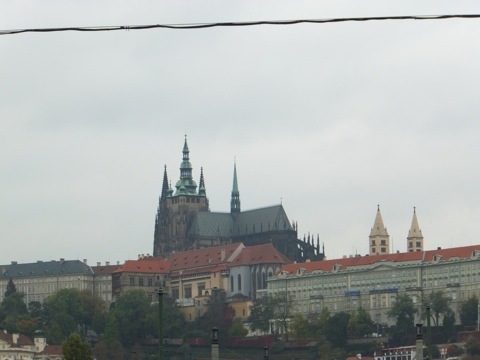 We took the metro & a tram to get to the hotel when we arrived in Prague. Today we opted to walk the whole way. Our bags feel nice & light when we are so layered up (and therefore are wearing the clothes that woud normally stuff our bags full). We also are just becoming pro at carrying the things around. 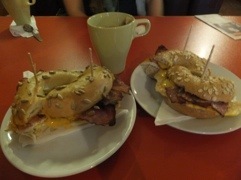 We Google Map’ed the walk…it was 1.6pm. Not too far, but pretty good for carrying a 50lb weight. At the train station we stuffed both bags into one of the giant lockers & sealed it up. We could have done luggage storage at the hotel, but we liked the idea of our bags being at the station waiting for us when it was time to leave. 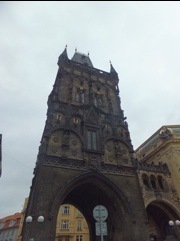 We then continued our trekking and walked to Charles Bridge. The bridge really isn’t that far from the train station (nothings that far apart in tourists Prague) but we still feel we can use the term trekking thanks to our ability to always take the long way. In our defense, we were in absolutely no hurry and had said we’d just wander until we got there…but we still zig-zagged through almost the entire city before we got to the river. 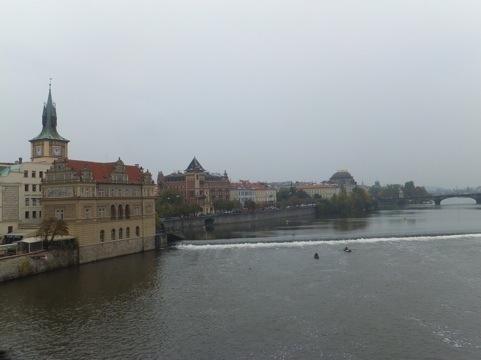 Charles Bridge is one of the top 3 must dos of Prague. 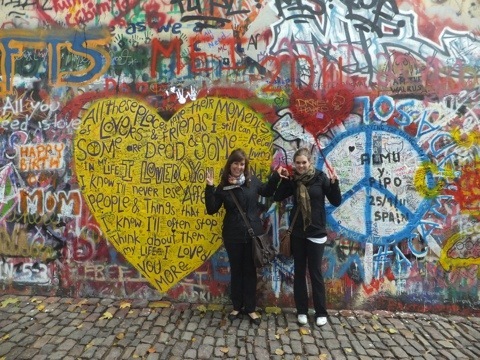 They say you haven’t done Prague until you’ve walked the bridge…so that’s what we did. We had meant to do it yesterday but our trip-reworking pushed it to today. In the end it worked out well, it wasn’t raining today! Charles Bridge dates from 1342 when Emperor Charles IV decided to commission a new bridge instead of repairing the old one washed away in the floods. Until the 19th century this was Prague’s only bridge that crossed the river. It’s a neat place to walk. There are interesting statues situated every few feet down the sides, street vendors have set up their wares on little fold-out stands and the views of the city are spectacular. You can see the castle, the National Theater and the river islands, all of which present great photo opportunities. An important thing about the bridge is it’s being the sight of a famous murder. St. John of Nepomuk was the priest of the king, and therefore the queen. The king once went to John and demanded he tell him what confessions the queen had to make, as he feared she was having an affair. John refused & refused. This was honorable, but only proved to make him a martyr. The king finally snapped, cut off John’s tongue & threw him off Charles Bridge. When John’s body disappeared under the water 5 stars appeared in the sky. These are now the symbol fo St. John of Nepomuk. 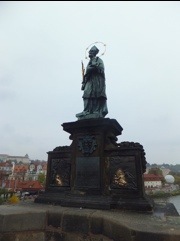 Now a days, there are two monuments to St. John on the bridge. There is a statue of him, with the trademark 5 stars over his head and plaques depicting his murder on the base. Tourists like to rub the dog on the left plaque and the woman on the right plaque for good luck. What they don’t know is that they are canceling their luck right out! It is actually only good luck to rub the woman and is bad luck to rub the dog. The uneducated folk are fine, seeing as the good & bad cancel out, but we were informed by our tour guide and were able to only earn good luck…maybe we’ll win the lottery…or a car…or find €5 on the street… Anyway, the second monument to St. John is a plaque surrounded by wrought iron work. It shows the broken man laying in the river. Touching the stars on the base of the plaque with your left hand & the body of St. John with your right grants you one special wish! We fought our way to the front of a crowd to give it a try. You can only do this once in your life and have it work, so we made sure to wish well! The Monument to Victims of Communism who Survived depicts how many people disappeared during Communist rule. A handful of people were executed and a few imprisoned but over 170,000 people left the country. 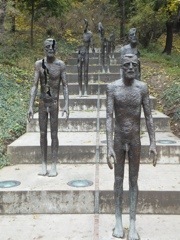 This monument depicts how people slowly disappeared and limb by limb escaped totalitarian rule. 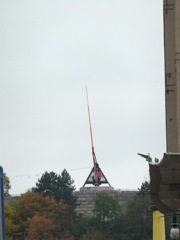 Next to the Communist monument is the Hungry Wall. 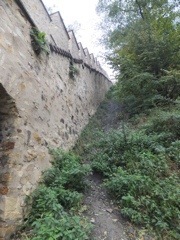 During the 14th century Charles IV used the building of this wall to provide jobs for the poor…it was the 14th century equivalent to FDRs work-for-food projects. Our walk back to the rail station was about as direct as the walk from it this morning…and by that we mean incredibly indirect. 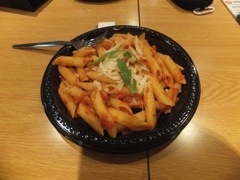 We were still there with plenty of time so we sat down for a pasta lupper (it was past lunch time but too early for supper). 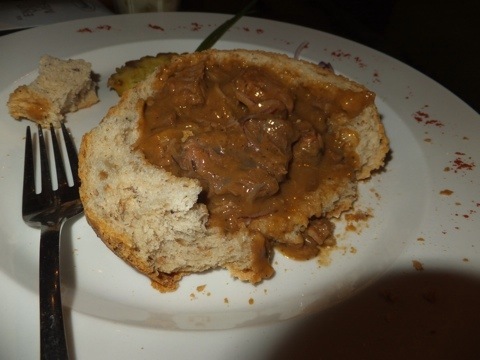 It was yummy…nothing special or anything, but cheap & cheerful. 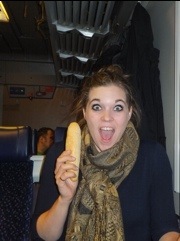 Now we are in Vienna, although so far we have seen the train station, our hostel and the 10 blocks between the two. Exploring tomorrow! It’s a marathon, not a sprint girls! We then walked to the Jewish Quarter, commonly referred to as the Ghetto, to see the sights of the Jewish museum. The term museum can be a bit confusing in this case as it is not just one large building of artifacts. 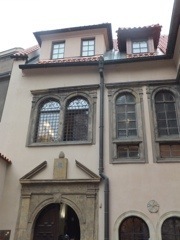 The Prague Jewish Museum consists of a collection of seven different locations. 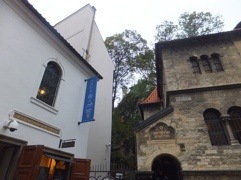 The Jewish Museum was founded in 1906 to preserve the valuable artifacts from the Prague synagogues that were liquidated during the reconstruction of the Jewish Town at the beginning of the 20th century. 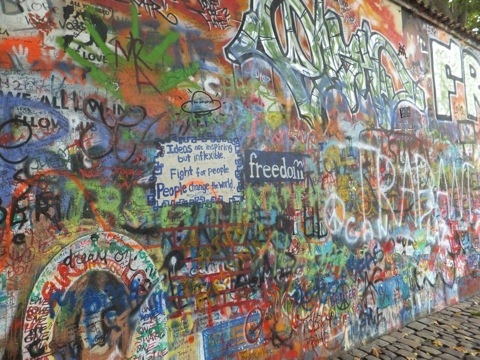 The walls came down and for the first time the Jewish community was able to live somewhere else in Prague. In 1942, the Nazis established the Central Jewish Museum in the city and brought artifacts from many liquidated Jewish communities and synagogues. Across Europe synagogues and Jewish communities were being destroyed but Prague’s remaind completely preserved, even added to with the liquidated artifacts from across eastern Europe. Why? Hitler had plans to created a museum in Prague display the “extinct race”. The “Children’s Drawings from Terezin 1942-1944” is housed in the upper sections of the synagogue. The Terezin Concentration Camp was located just outside of Prague and over 10,000 children under the age of 15 ended up imprisoned. When she was deported, a teacher in Prague brought only art supplies for the children with her. With these supplies she was able to carry out a secret art-therapy session. The children started drawing and painting what scared them, but soon learned to deal with those fears and focus both their art & their minds on what made them happy, and what they looked forward too. When the teacher was sent to Auschwitz she hid all the art to be found when the camp was liberated. Over 90% of the children of Terezin did not survive the war…for most all that remains is this collection of art. 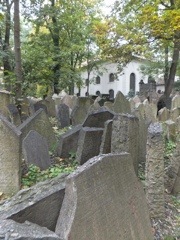 The next location was the Old Jewish Cemetary. This cemetary was established in the 15th century and tombstones can be found from this time, as well as for centuries after. Today the cemetary contains 12,000 tombstones, but there are many more people buried there. In the past the Jewish Ghetto was contained within a wall. It was originally built to protect the people of the area, but was soon turned against them and used to keep the Jewish people in. 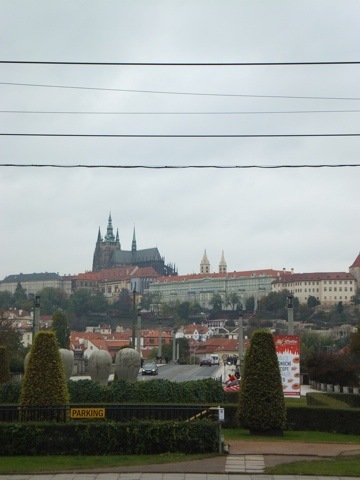 When the cemetary became full, the city of Prague would not grant the Jews more land…the were not even allowed to live outside of their walls, so they definitely were not going to be able to bury their dead outside of them. As a result, the Jewish community brought in soil and began burrying people on top of the existing graves. The cemetary is now surrounded by a wall of at least 8 feet and it is believed people are buried 12 deep in some places! This process has given the cemetary an unusual look. The ground is hilly and the tombstones lean in every direction. The grave markers also appear much too close together as a result of keeping all tombstones above ground whenever the ground level is raised. 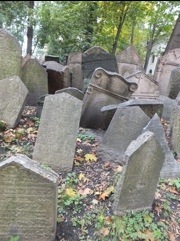 The Jewish Memorial in Berlin is said to be based off of this cemetary. You may remember us describing the hills and slants of that memorial. The Maisel Synagogue was built in 1590 by the Mayor of the Jewish Town. 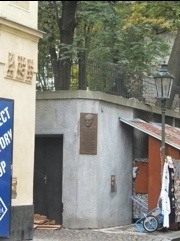 This stop featured the history of the Jews in the Czech lands exhibit. Unlike many Jewish sights, this exhibit begins in the Middle Ages and focus on the hardships the Jewish people faced in creating settlements and achieving legal & social status in eastern Europe. You can’t help but marvel at the strength & perseverance of the Jewish people…they have not had an easy run at things. 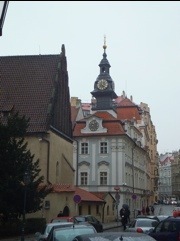 The Klausen Synagogue, from 1694, came next. This synagogue houses the exhibit on Jewish customs and traditions and highlights the significance of the synagogue in many Jewish festivals. We were able to learn about Jewish births, bar mitzvah, weddings and the Jewish household. It was incredibly interesting to learn about this different faith. The Ceremonial Hall, located next door, was built in 1912 as a mortuary house for the purification of the dead. It continued the exhibit on customs and traditions, featuring illness, medicine, death and cemeteries. 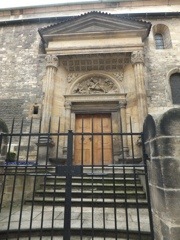 The Old New Synagogue was built in the 13th century and is the oldest synagogue is eastern Europe. The synagogue is perfectly preserved. It is simple with wooden seats ringing the rooms perimeter. The roof is made in the vaulted style, although instead of the usual 4-pillar vault it has 5-pillars. This synagogue was actually built by Christians, as the Jewish people were not allowed to build at that time. These builders were masters of 4-pillar vaults from building churches, but they carried too much resemblance to the cross to be allowed in the facade of a synagogue. As a result they invented the 5-pillar vault…which looks just like a 4-pillar except with a leg coming out at a random place that makes the whole thing off-balance & unsymetrical. The most ornate part of the hall was the Shrine of the Ark. This is the focus of worship and hold the sacred rolls of the Torah. There is a legend associated with the attic of the Old-New Synagogue (the dark wood part). It is said to hold the broken stone of the Golemn. No, we are not referring to our favorite creeper from Lord of the Rings, this is an even more murderous creature… The Golemn was a hardened clay man, created by a local rabbi to protect Prague’s Jewish community from the threat of the Catholic city. The rabbi noticed the growing acts of violence towards his people and caught wind of a threat that the Catholics had organized a mob that was coming to attack the Jewish Quarter. Reciting some ancient prayers & magical words, the rabbi brought the Golemn to life. When the Catholics arrived they broke through the gate using a giant wood battering ram, but before they could attack any of the people the wooden pole changed hands. The Golemn seized the battering ram and knocked down the invaders, killing many. The leader of the mob dropped to his knees in front of the rabbi, asking if he intended to enslave the city using his new killing machine. The rabbi replied that he had only created the creature to protect his people & that all he wanted was peace. With that the Golemn fell to rubble. There is another part to the legend…it states that the Golemn will reawaken to help the Jewish people when they are at their most threatened point. 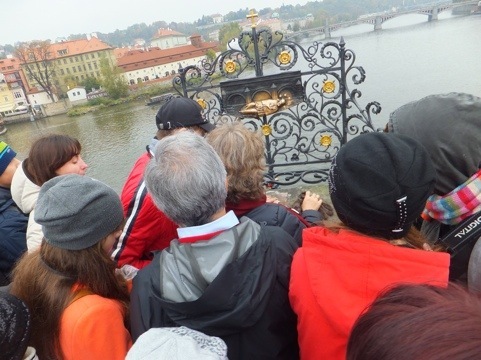 Considering the horrors we have been learning about, and the fact that the Golemn has not made another appearance, many of Prague’s Jewish people believe things are not looking good for the future. The final stop was the Spanish Synagogue. 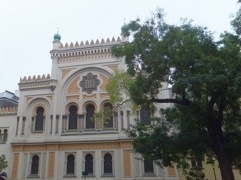 This synagogue dates from 1868 and featured an exhibit that concluded the history of the Czech Jewish community up to the present. The exhibit was extremely interesting as it talked much about Terezin, but also the contributions of Jewish people to modern art, literature and science. The synagogue itself was also extremely interesting. The entire interior was elaborately decorated. There was not a single surface that was not bright colored & patterned. These patterns were detailed and often carved right into the wood before they were colored (as opposed to just painted on). A recurring pattern was the star of David, which was also featured in the ginormous chandelier that hung over the seats. When we finished in the Ghetto we walked back through Old Town Square and along our tour route from yesterday. 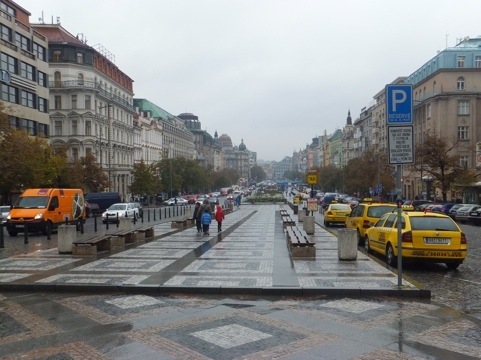 We knew this would take us to Wenceslas Square. This square is really more like a long, wide street…it even has traffic running down the center of it. One end marks the location of the bridge over the moat to the entrance of Old Town. The mixed architecture buildings running along the side frame an image of the National Museum at the other end. 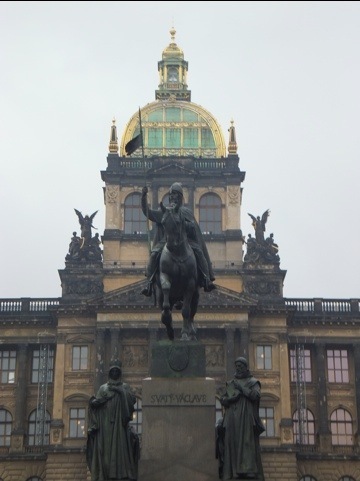 And in front of the museum, riding his horse as any good ruler should, is the statue of St. Wenceslas. 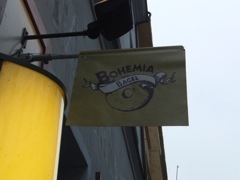 You may recognize the name from the Christmas carol (“Good King Wenceslas looked out, on the feast of Stefen” and so on…). He was in fact a very ‘good king’ right up until his murder in 929. He was well-educated, brave & kind and is still seen as an icon of Czech unity. There is a legend that King Wenceslas still lives within the Blaník Mountain, east of Prague, with an army of his men. It states the mountain will open up and they will ride out to the rescue when the Czechs face their darkest hour. Their lack of appearance in 1938 when the Nazis arrived, in 1948 when the Soviets overtook the country and in 1968 when the Communists crushed the Czech revolt & therefor the Czech citizens furthers the belief that the worst is still yet to come for this constantly challenged nation. 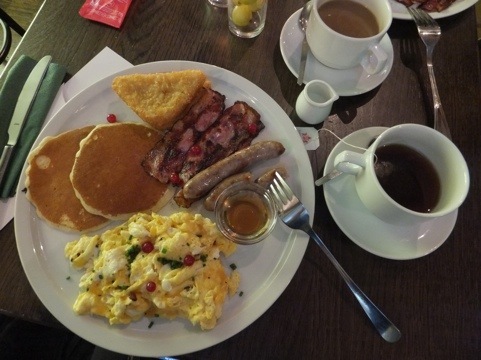 We ate supper in the hotel restaurant, because we were already sitting at a table there & were starving. 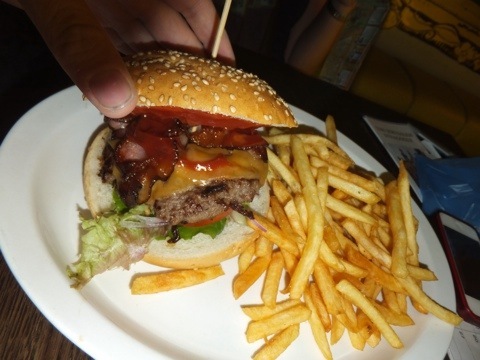 We had BBQ Bacon Burgers. They were totally delicious. 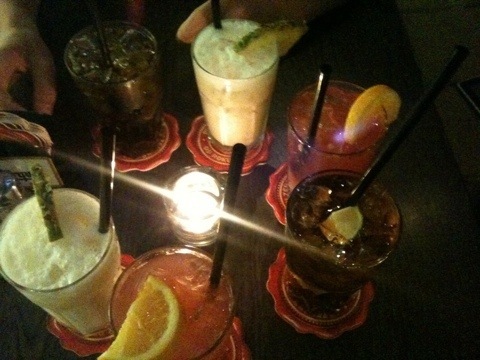 We also has two 2 for 1 drinks each while we worked. We then went upstairs only to come back to the restaurant. One of our roommates convinced us to come down with him so he wouldn’t have to eat (& drink) alone. 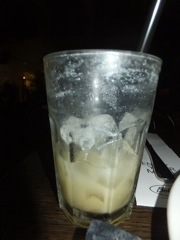 We had another two 2 for 1 drinks each then…don’t judge, it’s was a slightly stressful, brain frying type day. – There once was a princess named Starosta. She was the daughter of a pagan king but wanted nothing more than to commit her life to Christianity & become a nun. Her father would not hear of this and arranged for her marriage to a foreign prince. The night before the wedding the devote young woman prayed and prayed that God would save her from this marriage. She awoke the next morning finding her prayers had been answered, overnight she had grown a long, thick beard. The prince took one look at her and refused to go through with the marriage. It would seem the princess was avid…but, in fact, her father was so furious he burned her at the stake… For her martyrdom she was made a saint, the patron saint of bad relationships. An interesting fact, but what we really learned is that before you pray for help in your love life be prepared to borrow your fathers razor! – Tim Hortons constitiues 66% of all coffee sales in Canada, 76% of the sales of baked goods and makes up 23% of all fast-food restaurants in our country…that’s twice as much as McDonalds. The rest of our day was spend on Sandemans walking tours. We walked to the Starbucks in Old Town Square, not for a drink but because it is the meeting point for the free city tour. We had a very pleasant guide named Amy who was from Texas but moved to Prague with her husband after they visited & really loved the city. She was uber perky & animated, which made her a great guide! Are you ready for the Prague highlights? Well they are coming at you either way…. We started in the middle of Old Town Square and did the pivot tour. 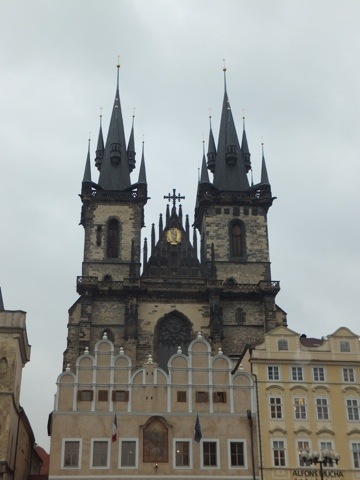 Amy pointed out all of the different types of architecture (Prague is full of gorgeous buildings built in every time period & style you could name!). In the pictures below try to pick out which is which! There was baroque, gothic, neo-classical, and what square would be complete without a little Disney-style? That there church, sticking out over the tops of other buildings looking like Walt may have had a hand in it’s design, is Tyn Church. This church is from the 14th century and it’s towers are 80m high. 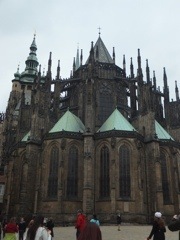 With the four small spires on top it definitely looks like a Disney villain could live up there. You may notice that the towers are not the same size though. The project ran out of money at the end and they cut costs by downsizing that last tower by a tiny bit! Another gorgeous gothic sight was the Powder Tower. 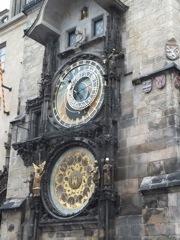 It dates from 1475 and was one of the 13 gates into the old city of Prague. When the new town was built they tore down the wall (you don’t need to defend your town from another part of your town) but left this tower. It was then used to store gun powder…which is where the name comes from. 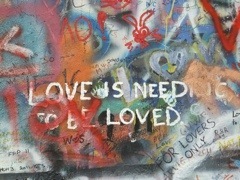 Mozart loved Prague. 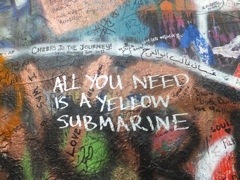 The people of Vienna claimed his music was too complicated with too many notes, so he ventured north to Prague. The people here loved him and actually gave Mozart a 30 minute standing ovation when he first played Figaro at the Estates Theatre. 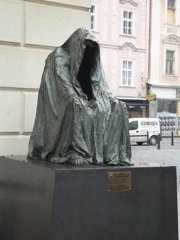 Mozart debuted Don Giovanni at this theatre and the people of Prague built this creepy statue in his honor. The statue is a ghost from Don Giovanni. 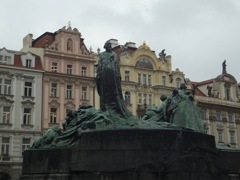 We also passed through the Jewish Quarter and Wenceslas Square, but more on those tomorrow. As usual, the guide ended the tour with a really epic story (to pump you up to give them a good tip). She told us about how the Czech Revolutionaries battled the Nazis for 3 days after WWII ended and eventually bartered with them to kick them out of their city. The Revolutionaries fought the Germans for two days with the balance constantly swinging back & forth. A final shift happened when a Scottish POW got a help message out to the Allies, stating that the Nazis were now threatening to bomb the city, and the Soviet army was scouted only a days march away. A deal was actually made to let the Nazis leave unharmed before the major players arrived in exchange for not bombing the city. It was a great tale of bravery that ended with 30,000 untrained malita chasing 90,000 Nazi soilders out of Prague before the Soviet army could even get there to liberate them. Awesome! Our plan for the afternoon was to visit the castle & surrounding area. Conveniently Sandemans offered a Castle Tour (of the grounds and area) that started right at the end point of our free tour only 30 minutes later. We jumped on this! You know we love a good walking tour…you can look at things by yourself all you like, but they mean so much more when you have someone telling you about the history, backstory & people! 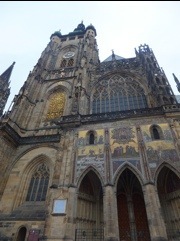 Prague Castle is the largest castle in the world. It covers an area of approx 18 acres. The castle dates back to the 9th century and the foundations of the Basilica of Saint George and the Basilica of St. Vitus were laid in the 10th century. 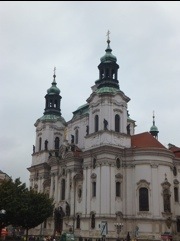 The Kings of Bohemia, Holy Roman Emperors and the presidents of Czechoslovakia and now the Czech Republic have had their offices here. Even the Nazis and Communists used the castle as their headquarters. Each monarch who lived in the castle added their own additions. For this reason, the castle looks more like a mish-mash of palaces, churches, towers and original castle remnants. Today the castle is made of 4 churches, 4 palaces, 5 halls, 8 other buildings and 5 gardens. 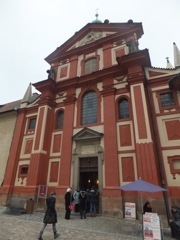 St. George’s Basilica is the oldest building in the castle. It was founded in 920. This means the style is very romanesque…until a baroque front was added to the church in the 17th century. It fails to blend in harmoniously with the old church behind it. St. Vitas Cathedral was founded in 1344, however it wasn’t completed until 1923! Over 600 years there was never enough money to complete the cathedral. The church was completed in the gothic style it was begun in but the architects who finally finished the cathedral added a bit of themselves to the design. 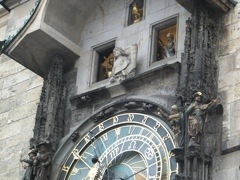 Carvings of 20th century men in business suits can be spotted on the front just below the rose window. Also note that due to the constant lack of funds almost all of the platforms meant for saintly statues are empty. – The people of Czech used to have to name their kid based on what day they were born. There was 1 boys & 1 girls name for each day of the year and you were required to use that name…they are even featured on a separate circle of the clock (it’s the bottom, white circle). Now a days you have the choice of names, but most people still choose one of the names from the clock…you actually have to get a nurses permission to use an original name. – St Vitus (who you will recall was the patron saint of the castle church) was the saint of actors, comedians and epilepsy…because thsee fit together… He also was the guy to pray to to prevent being struck by lightning, attacked by an animal and oversleeping. While it may be the lamest, oversleeping is probably what he has to deal with most. – Just as the French loved their guillotine, the English loved the axe and everyone liked a good hanging, the Czech of a fun history of defenestration. Twice in their history the Protestants have used this technique to dispose of Catholic leaders. What is defenestration, you ask? Throwing someone out of a window of course! And as a random closing question: What is the first thing you notice when you look at this picture? Was it the sprawling castle? Perhaps the huge gothic cathedral? Or, like us, did you first notice the ad for the jam cookies!